Robert Michael has been involved in martial arts since 1976 when, while an undergraduate student at the University of Connecticut, he joined a martial arts club on campus. After graduating with a BS degree in Electrical and Computer Engineering, he continued his training evenings while working as an Engineer at major corporations. In 1983, Mr. Michael began training in Chinese and American Kenpo with Master Leo Williams, under the direction of Master Kalaii K. Griffin. He attained the rank of 1st Degree Black Belt (Sho Dan) in 1989. A major part of his training in Kenpo consisted of learning to teach the system to beginner and advanced students of all ages. He was also the business manager of the branch school in Connecticut. Robert Michael formally began training and studying Taijiquan (T’ai Chi Ch’uan) and Qigong (Chi Kung) in 1993 at Central Connecticut Tai Chi Ch’uan (CCTCC) in Meriden, CT, with Mr. David Ritchie. His training and practice included health, martial, and spiritual aspects of the arts. He was certified by CCTCC to teach the Yang-Style T’ai Chi Ch’uan Short Form based on Cheng Man-ching’s 37-Postures in 1997. Mr. Michael has also attended various Taijiquan and Qigong workshops and seminars with noted teachers from around the country, including the late Master Jou, Tsung-hwa, Dr. Yang, Jwing-ming, Dr. Jay Dunbar, and Dr. John Painter. In 2006 he began training the Li Family Jiulong Baguazhang and Daoqiquan under the direction of Dr. Painter and Shifu Robert Castaldo and was certified in February 2016 as an Instructor of Jiulong(TM) Baguazhang Basics Program. 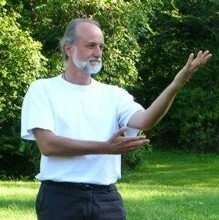 Robert Michael has been teaching Taijiquan classes as part of CCTCC and on his own since 1997. Since 2008, after leaving the corporate environment, he has been focusing on training, studying, and teaching Taijiquan, Qigong, and Jiulong(TM) Baguazhang. In addition to teaching evening classes, he also teaches at the Senior Centers in Middletown, Haddam, Cheshire, and Wallingford, CT. Mr. Michael has also been a guest instructor at the University of New Haven, Middlesex Community College, Yale University, and the Middlesex Institute of Lifelong Education (MILE).